Three Labour councillors have been suspended over social media posts about Israel. Nottingham councillor Ilyas Aziz and ex-Blackburn mayor Salim Mulla are both said to have shared a post which suggested the state of Israel should be relocated to the US. Burnley councillor Shah Hussain said he would "fight" his suspension for a tweet sent to an Israeli footballer. Mr Aziz said he did not write the 2014 post, while Mr Mulla has not commented. It comes after Labour leader Jeremy Corbyn insisted the party was "united in opposing anti-Semitism". The posts were highlighted on the Guido Fawkes website. One, shared from Mr Aziz's account, was a comment stating: "Jews and Muslims lived together in the Middle East, in peace pre 1948. "Perhaps it would have been wiser to create Israel in America it's big enough. They could relocate even now." The Radford and Park ward councillor's account also features a series of re-posted comments and images criticising Israel. A comment posted with an article about Nazi Germany in 2014, said: "A reminder of the treatment and suffering of Jews in Nazi Germany. ARE THERE ANY SIMILARITIES TO HOW ISRAEL IS TREATING PALESTINIANS." Asked if he had been suggesting Israel should be relocated, Mr Aziz told the Press Association: "I didn't write that." Blackburn with Darwen councillor Mr Mulla reportedly described "Zionist Jews" as a "disgrace to humanity" in a social media post. Mr Hussain, who represents Burnley's Daneshouse with Stoneyholme ward, intervened in a Twitter conversation in 2014 between footballers Joey Barton and Yossi Benayoun over the conflict in Gaza. In a message directed at Benayoun, he wrote: "You are an complete and utter plonker, you and your country doing the same thing that hitler did to ur race in ww2"
When approached by the Press Association, Mr Hussain said he would "most definitely" fight the suspension. "If Jewish people find it offensive then I think they need to think about what the rest of the world thinks," he said. The Guido Fawkes website reported Mr Mulla also shared a message suggesting Israel should be relocated to the US - the same post which led MP Naz Shah to apologise in the Commons and have the whip withdrawn. Mr Aziz said politicians needed to be careful when commenting on the Middle East, but added: "The thing you have got to try and appreciate is that if a particular government - whether it's the Israeli government, whether it's the British government - if the government is actually doing something wrong they should be criticised. "But not the population itself, it's got nothing to do with them, it's got nothing to do with the religion." Mr Corbyn has announced an independent review into anti-Semitism and pledged to tighten party codes of conduct on this and other forms of racism in an attempt to put a lid on the furore. 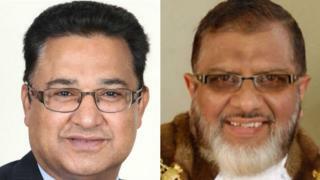 A party spokesman confirmed that all three councillors had been suspended, but made no further comment.